Feb. 24, 2014, 9:03 a.m.
For most of my life, from WWII till now, I have been hearing about “The Peace Dividend”. After reading today’s New York Times I can see the light at the end of the tunnel. President Obama is ending our wars and making it possible for people who need medical treatment to get it at affordable prices. I believe that by the end of this century, President Obama will go down as one of our greatest Presidents. Feb. 24, 2014, 7:27 a.m. Thank you for discussing this topic. I was first introduce to this topic by a youtube video “Wealth Inequality in America” (See url: http://youtu.be/QPKKQnijnsM ) and has been viewed over 14 million times. Feb. 23, 2014, 10:44 p.m.
Nations, & the people who live in them, compete by providing products or services, that others want @ a price they are willing to pay. Nations with large public sectors(both as a % of GDP & from a regulatory/law standpoint) cannot compete as the impact to overhead costs makes them non-competitive in the long run…..unless they sell off natural resources to pay the bills….a short term solution. The result has always led to reduction of middle class and the opportunities for the young & legal immigrants. This brings about a super-rich small group, shrinking middle class and lots of poor. Since the growth of the public sector(s) hasn’t improved the growth of middle class & opportunity….let’s try it the other way! Shrink the public sector! Feb. 23, 2014, 9:59 p.m. The concept of income inequality is only a predictable outcome from the complexity that has gripped our lives and the dwindling number of individuals with ability to understand and economically exploit new technology. The harder it becomes the fewer people are capable. Survival of the practical, not academic, intellectually fittest is the new iteration of a very old principal. The answer to closing that inequality is to produce a much larger percent of the population able to leverage their skills to meet rapidly changing economic and technologic trends that require far from traditional approaches. So radical changes in the education of our youth, starting in “middle school”, is a necessity. However, WHO is capable of making this radical change a reality AND bringing it from theory to broad practice. That is truly modern society’s dilemma. Traditional teachers and administrators are operating to a large part on automatic pilot using old metrics of traditional academic test performance and university placements to monitor success. The results are predictably pretty good. “Tradition” earns another year and continues while the real world gap as measured by that bottom-line metric called INCOME widens and everyone wonders why. It is time for RADICAL change in the education system—individual student assessment of skills and KNOWLEDGEABLE, EFFECTIVE coaching by “counselors” and administrators firmly grounded in the real world must direct each student’s most EFFECTIVE path. With appropriate re-assessment in the formative years. Where can we find such counselors and administrators enough to be present to the vast majority of US students in PUBLIC education…. I HAVE NO IDEA, BUT IT IS UNDENIABLY NEEDED AND THE SOLUTION TO THIS “PROBLEM”. Also, make no mistake, human beings need personally identifiable incentives and to a very great extent income has long been such—- it must remain a differentiator and reward for properly and effectively navigating the career building process resulting in a profession/occupation that is truly loved as it is matched to personal talents. Feb. 23, 2014, 9:12 p.m.
A very useful contribution to a very important and topical subject, especially with all the BS being circulated over raising the minimum wage from a paltry $7.25ph to a paltry $10 per hour. I realize that minimum wage is only one small piece of this complex jigsaw puzzle but its a baseline for all the rest and needs serious discussion and resolution. Feb. 23, 2014, 8:51 p.m.
We are both great fans of your “Thoughts from the Frontline” and noticed your invitation to anyone who has written up an article on how the distribution of the world’s wealth follows a power law to send it to you pronto. We are two scientists, coauthors of the #1 bestseller “Life Extension, a Practical Scientific Approach” (Warner Books, 1982) who write extensively on a variety of scientific as well as economic issues (see our free newsletter at www.life-enhancement.com; the website is the property of a company licensed to sell our dietary supplement formulations, but the newsletter is written entirely by ourselves and is not edited by Life Enhancement Products, Inc.). We have written an article (based upon economic experiments published in SCIENCE magazine—see reference below) on how the investment in avoiding harms to third parties decreases with increasing numbers of bidders in a market. We disagree with the authors of the paper that this reflects a moral failure due to markets, and instead argue that it may take place as a result of a power law. Although we realize that this doesn’t explain the economic distribution of the world’s wealth, perhaps it will interest you as an application of power laws to markets and economics. We like your suggestion that somebody write up how power laws may explain something about income inequality and note that this is a nice open field just awaiting some original new ideas that needn’t come from professional economists or even somebody with a Ph.D. but just some creative thinkers intrigued by the potential for a world-changing view. A new paper studied the effect of markets on moral values by setting up a moneymaking experiment in trade whereby it would cost people money to avoid harms to third parties. The researchers found that the more the number of people involved in a market trade, the less money people would forego to avoid harms to third parties. They concluded, therefore, that markets had a negative effect on moral principles. the usual course of events, would be euthanized at that point, but for the sake of this experiment would be allowed to live if the owner of the mouse were willing to forego a certain amount of a sum of money (the price for allowing the mouse to live).) The idea was to see what effect being in a moneymaking trade arrangement, a market, would have on the price people were willing to pay to allow the mouse to live. In the individual decision option, Option A, a mouse would be allowed to live but the participant would receive no money. Option B meant that the mouse would die but the participant would receive 10 euros. There were 124 participants in the individual decision option, of which 45.9% were willing to allow the mouse to die in order to get 10 euros. In the bilateral market (2 participants traded for prices), 72.2% of sellers were willing to let the mouse die for prices below or equal to 10 euros. This difference was statistically significant from the individual decision option. In the multilateral market (where there were 7 bidders), 75.9% of sellers were willing to kill a mouse for less than or equal to 10 euros. This, too, was statistically significantly different from the individual decision option. The more bidders, the lower the average price offered in exchange for allowing the mouse to live. (In a separate experiment, people could either keep and spend a coupon or take a certain amount of money. The effects of numbers of bidders in this condition revealed no significant price trend.) The authors conclude, therefore, that the market had the effect (and the larger the market, the greater the effect) of reducing the price paid for a moral outcome (allowing the mouse to live). organizing systems as described in the book UBIQUITY by Mark Buchanan (Three Rivers Press, 2000). As explained in UBIQUITY, for example, if you look at a sandpile on which grains of sand are being dropped one by one, eventually at some point you will have an avalanche. If you double the amount of energy released by the avalanche, the avalanche becomes four times less likely. You see the same pattern with earthquakes: the larger the earthquake, the less likely that size event will occur, consistent with the mathematical power law you see with avalanches. Thus, we propose that the higher the number of bidders in the market, the lower the price paid to avoid harms to third parties, is a power law, something that is mathematically built into markets as self-organizing systems. It is not that people become less moral as the number of bidders increases; it is that the likelihood of the decision of each individual determining the average price becomes less and less as the number of bidders increases. The researchers wonder, as indicated in their summation, whether under some circumstances decisions should be made by a different mechanism than markets. Whether a political process would result in a more “moral” outcome than a market is we believe questionable. The more voters, the less likely that your decision will affect the outcome of an election and, hence, the less likely that voters will concern themselves with harms to third parties. Moreover, the less likely that your decision will decide the outcome of an election, the less likely you will have an incentive to be well informed before you vote, the “rational ignorance” problem. The authors note that “it is a pervasive feature of market interaction to impose costs on uninvolved third parties.” We agree. Yet, there can be no doubt that the production of externalities (costs to uninvolved third parties) is a pervasive feature of political processes. Moreover, there may be costs in the use of politics as a way of making decisions by large numbers of people that go beyond that of markets. Even as the authors themselves noted, not all the participants chose to take part in the bidding of their experimental market(*). In politics, you can refuse to vote but the outcome of the election (the decisions of other people) will be imposed upon you anyway, whereas refusing to enter the bidding in a market transaction allows you to opt out, at least in part, of the costs of whatever other people decide. In the usual trade, opting out means you can keep your money and use it for something else. 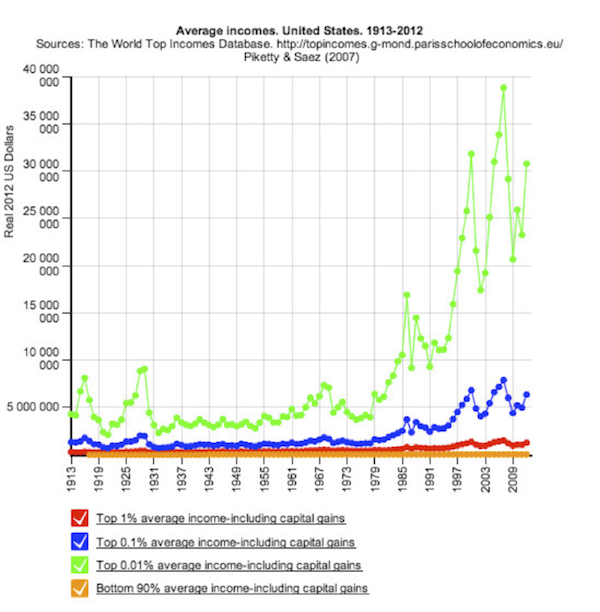 Feb. 23, 2014, 8:41 p.m.
Income inequality has been growing in the US for more than 40 years, for several mutually reinforcing reasons. 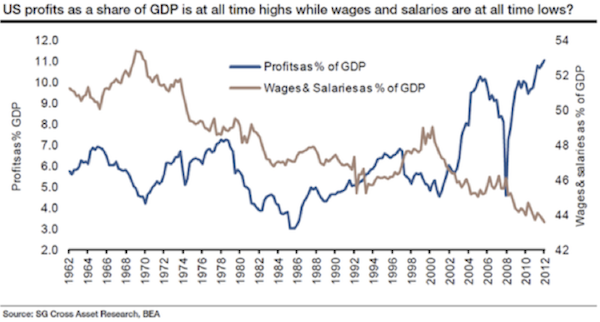 It is a cause of neither the Great Recession nor the slow recovery. The Great Recession was caused by a sudden stop in the high credit growth of the previous decade and a half, while the slow recovery is the result of the ongoing deleveraging of the resulting excessive debt. Serious economists and historians know this and, if they’re being honest, will say so publicly. However, some of the policies forced on us over the last 20 years or so by those attempting to mitigate growing wealth inequality (which is related, but not the same) are directly implicated in the stock bubble of 1996-2000, the stock crash of 2000-2, the mortgage bubble of 2002-7, and the credit crisis of 2007-9. These policies are not cures of anything, but just rehashes of what got us to where we are in the first place. The centerpiece of these policies has been to entice lower income people into debts (especially mortgage and student debt) they cannot repay and enjoy the ride while they can freely borrow. These gambit is coming to an end. Income inequality has three main causes: the gap between the college-educated and those without, the breakdown of the two-parent household norm, and the effects of automation (more important) and globalization (less important). The first and third strongly reinforce each other. 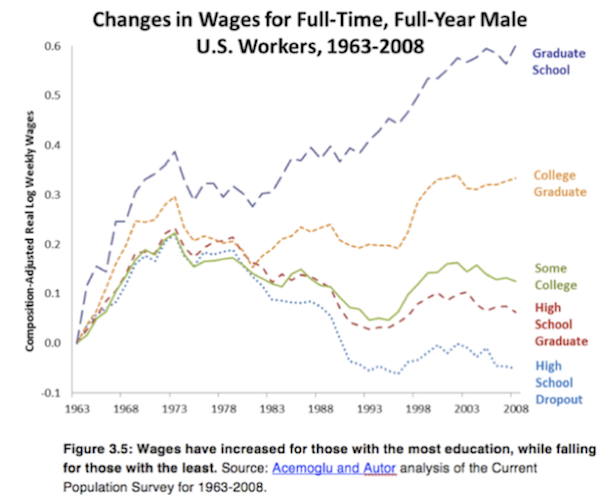 Until the 90s, the working class (typically with no more than a high school education) could hold its own, even as the college-educated were moving ahead. After the 1991 recession, that was no longer the case. The second cause is powerful both in its static effect on household income (lowering the income per household) and its dynamic effect in reinforcing poor prospects for later generations, who are likely to repeat the behavior. Reinforcing it is “assortative mating,” which means doctors marry doctors and lawyers marry lawyers, rather than nurses and secretaries. These latter causes have contributed to the rise of a caste system in America, something many are still oblivious to, because it’s genuinely new. Political action centered in Washington will not cure it, because Washington is emphatically part of the problem, not its solution. The Washington metro area now has the highest per capita income and per capiita wealth in the country. (You read that correctly.) Washington has become a true parasitic imperial center, the heart of a cronyistic plutocracy that is driven by public servants cashing in on public service in the private sector. The change in this direction in just the last five years has been stunning, but its roots go back 25 years, at least. Inflation can’t reduce inequality either. While it hurts everyone, it hurts the least affluent the most, because they hold all their wealth in cash. The generational angle cannot be neglected. The Millennial generation is starting its adult life in weak position, indebted, and with poor job prospects. Their parents, the Boomers, and their grandparents have reaped the large majority of the benefits of postwar economic growth, while the Millennials are paying the bill for most of the excess. We know what reduces both poverty and income inequality: strong economic growth built on real fundamentals, including high capital investment. Most of our policies now are designed to discourage this and instead encourage speculative and other non-productive uses of capital, as well as dependency. A strong job market, pulling in many who are marginally attached to the labor force, is the key. 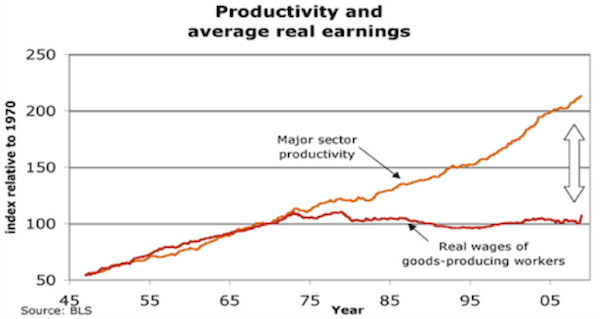 The strongest reductions in inequality and poverty occurred in the 1960s, the late 1980s, and the late 1990s, all of which featured high real growth and tight labor markets. While factors such as demographics are beyond the direct reach of public policy, public policy has had a real and destructive effect, contributing to the rise of income inequality. Any hope of reversing these policies means also a hope that real growth will pick up, the labor force will start growing again, and income inequality will shrink. Feb. 23, 2014, 7:27 p.m. I just want to tell you how much I have benefited from following your ideas these past few years. This is my first comment. I appreciate what you do! Now, as regards Front Line Thoughts for this week. You are correct that great wealth will provide great benefits for society. This will always be true as long as this wealth is invested or deployed correctly - as you yourself say. What if great wealth is NOT deployed correctly, though? Well, that’s where the authors of the paper with which you take issue may have a point that will have to be addressed, sooner or later. Feb. 23, 2014, 7:03 p.m.
Feb. 23, 2014, 6:14 p.m.
One simple, perhaps simplistic, way to increase opportunities for lower income people would be to modify the current affirmative action programs to give priority to people from lower income families. The current system benefits some individuals from groups that have been discriminated against in the past, but are now successful. Why not focus univeristy admissions and government contract preferences for individuals from lower income groups—say the bottom fifth. I have mixed feelings about this since there is a strong economic case to hire the best,regardless of background and I can imagine difficult administrative issues with such a change, but if we are to have affirmative action, should it not focus on the problems of today.